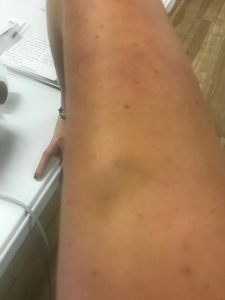 The campaign shared images of bruising on Davidson's arm, adding that her neck, shoulder, and lower back were also injured in the attack. Davidson wrote in her report to police that the "right side of [her] head" was "throbbing and in pain" after the attack. Stark has a history of aggressive behavior when tracking Republicans. Last year he was arrested, and later convicted, for disorderly conduct in Virginia as he attempted to cover Republican gubernatorial candidate Ed Gillespie, according to the Washington Post. Stark was similarly arrested back in March after pushing a female staffer for Interior Secretary Ryan Zinke to the floor and was charged with simple assault by U.S. Capitol Police. American Bridge did not immediately respond to a request for comment on Stark's most recent arrest. The Laxalt campaign released a statement saying Davidson is "tough" and "will not let this stop her from doing her job—no matter what the other side throws her way." "Last night, politics in Nevada reached a new low," said campaign spokesman Parker Briden. "Assaulting the female campaign manager of an opposing campaign is disgusting and it has no place in our system. This mob behavior from the left is out of control." The campaign also shared images of Stark in police custody outside the venue where the incident occurred. An accounting of the incident by the Laxalt campaign provides additional information on the attack, including an accusation that Stark told Laxalt he could "make this stop" as he maintained his hold on Davidson. 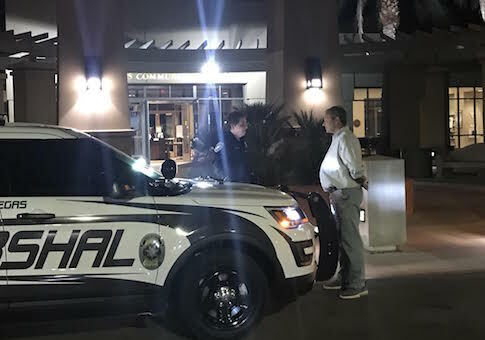 "After an education rally, a large male liberal operative began chasing members of the Laxalt campaign and the Attorney General, getting physically aggressive to push himself onto staff. When the team entered a side room and closed the door, the man pushed the door open—trapping Kristin in the doorway, grabbing her arm, and forcefully twisting it behind her back and squeezing. She screamed, "You’re hurting me! Stop hurting me!" but he would not stop and grabbed her arm tighter—creating painful bruises and straining her neck, shoulder, and lower back. The man would not relent and screamed: "You can make this stop, Adam." Kristin was terrified and begged for him to stop and could not get free until Las Vegas City Marshals intervened. They arrested him, and while Kristin’s head, neck, and arm were throbbing with pain, they took him to the Las Vegas City jail." Fox News was first to report on the Tuesday arrest. This entry was posted in Politics and tagged Adam Laxalt, Nevada. Bookmark the permalink.